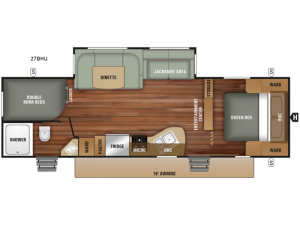 This Starcraft Mossy Oak 27BHU travel trailer is designed for a larger family or those who travel with extra friends. The double bunk beds, U-dinette, jackknife sofa, and queen bed supply numerous areas for people to sleep. The 16' electric awning with LED lighting provides a cozy area to wind down your nights. You will not have to worry about clustering in and out of the entrance because of the double entry feature.